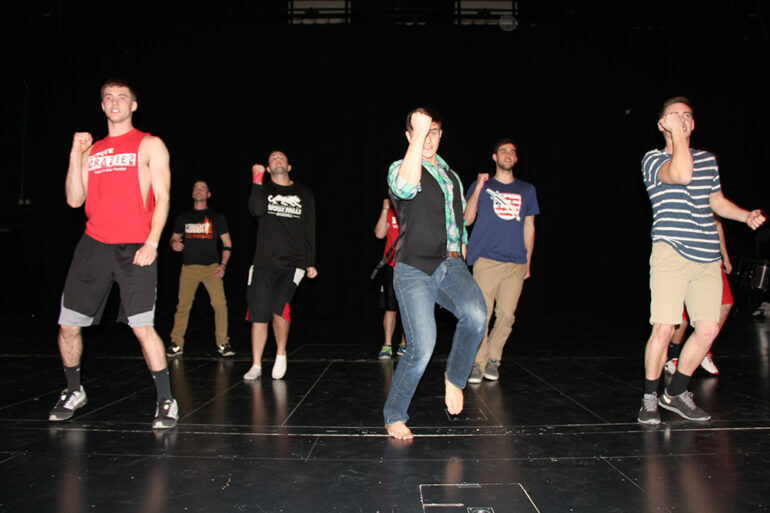 Comedy and music will soon reign supreme in Aalfs Auditorium at Slagle Hall as University of South Dakota Greek members present their 92nd annual Strollers show this weekend. Strollers is one of USD’s longest traditions, and is an event filled with theatrical skits from sororities and fraternities on campus. Lindsay Sparks, adviser of Strollers, helps coordinate the event by providing practice space for the students involved, along with communicating and making sure everyone has creative input. The skits include song and dance filled with “quips” and jokes directed and choreographed by each cast. The show will be presented Feb. 27 and 28, and tickets can be purchased in advance for $10 or $12 at the door. Sparks said the groups who participate in the event are very artistic, energetic and committed. “They’ve been practicing since January 12, and we’ve been meeting since November,” she said. In that time they’ve been writing scripts and making costumes and other theatrics — all from the ground up. Greek life is heavily involved in Strollers, making it an interactive community for the chapters involved. Junior Lucas Peterson, president of the Tau Kappa Epsilon fraternity, said that Greek houses are paired with one another to perform the skits. This year TKE is paired with Sigma Alpha Epsilon and Alpha Phi. Peterson said Strollers helps fraternities build relationships with each other by working together for philanthropy events. “It’s a great way to bring together different fraternities and sororities that normally wouldn’t interact or collaborate on a project with each other,” Peterson said. The event also promotes charitable organizations that spread awareness for certain social issues. The event is different each year because of the varying creative levels of the casts. Senior Allison Buss, president of Strollers, said she predicts a positive outcome for this year’s show. Sparks said attendees can anticipate to laugh and see a lot of enthusiasm at the event.